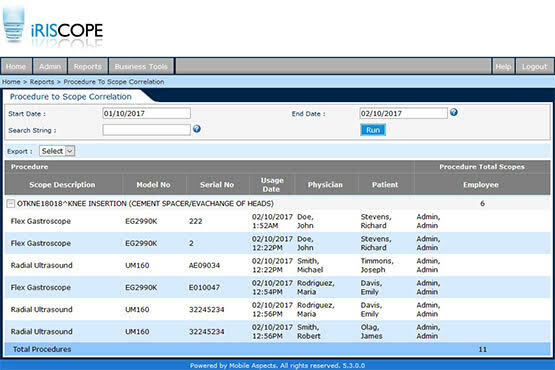 From patient use, to washing, and back into storage, you need a solution that documents the entire roundtrip of your scope fleet. Are you prepared? Mobile Aspects has your solution. Demonstrate best practice during your next regulatory visit from Joint Commission, DNV, Department of Health, OIG and others. With inspectors looking ever more closely at scopes, make sure your hospital is meeting the highest standards. Are you prepared for Joint Commission? Let our experts review your processes with you. Request a demo. Get your scope-related processes standardized across your hospital or multiple campuses with one system of record. Get rid of your paper log books and printed tickets. Enable electronic documentation of all your scope-related processes and take advantage of powerful data analytics. Auditing agencies are very concerned about scope usage records. Surveyors are looking for an electronic, real-time report on scope usage, which patients were treated, and the dates of service. Are you prepared?